There are so many things to love about these audio releases from Galaxy Audio. I’ll try to touch on all of them, at least all the things that make these stories from the Golden Age my favorite. But, before I do that I need to explain a bit about these stories. During the middle of the 20th century, America was treated to short stories by many writers in many genres in the pulp magazine publications. These magazines were nicknamed pulps due to the cheap paper used in printing where the pulp could be seen and felt in the paper. This enabled the publishers to sell them for cheap, usually around a nickel a copy. There were many titles to choose from and many genres. There was science fiction, fantasy, detective stories, westerns and adventures of all sorts. 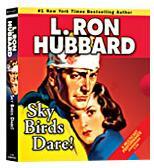 L. Ron Hubbard wrote for all the genres and was one of the most prolific pulp writers. Audio Press and Audio Galaxy are releasing all these Hubbard pulp stories on a regular basis and are keeping true to the pulp fiction era. With the printed books they have the pulpy feel but the covers are a sturdier stock so they will look good on the shelf and can withstand multiple readings. The audiobooks are where I fell in love with these classic stories. Each book released is also released in audiobook form and the CDs have the same artwork as the books. The artwork on all the books is a great representation of the over the top graphics from the original pulps. What makes the audiobooks so great is the superb production behind each one. The books are not merely read to the listener, instead Galaxy Audio has brought back that old-time radio thriller genre from the same time period as the pulps. Everything from the narration to the character acting is so well done that as a listener you will feel as though you are in the middle of the story standing next to the over the top characters created by Hubbard. In each production there is a full cast performance by some excellent voices that are able to capture each character perfectly. The sound effects keep the story rolling and help the listener get lost in the story and the music keeps the mood flowing as the change in chapters or stories come in. The books can range from novellas to several short stories which come together to make a nice pulp fiction book or a two-hour performance. This book, “The Dive Bomber” is a single story or novella and is full of some great air adventures which will keep you on the edge of your seat through the entire story. Originally published in the July, 1937 issue of “Five Novels Monthly,” and tells the story of daredevil pilot, Lucky Martin. Lucky has designed a new bomber plane that the Navy is interested in. The only problem is that, during each test run, the plane crashes. When a representative of a foreign nation approaches Lucky to purchase the design, Lucky turns him down. With all the crashes the Navy determines the design is flawed and that they will not be purchasing the planes. This could ruin Lucky, once again the representative approaches but this time when Lucky turns him down the foreign powers flex their might by kidnapping Lucky’s girlfriend and threatening him to finish. Lucky will never allow his design to go to a potential enemy and will do everything he can to save his girl, and his plane. Daring test flights, air battles and sabotage make this story an adventure to not be missed. I’m really enjoying all theses stories from the Golden Age, that are being released from Galaxy Audio and Galaxy Press, especially the short audiobooks they are releasing. Galaxy Audio has been releasing all the short stories by L. Ron Hubbard from his Pulp-Fiction writing days of the mid-20th century since 2008 and each month there’s a new release. In the paperback versions they are giving them the look and feel of the old pulp magazines, but even better Galaxy Audio has created what I call Audio Pulps in their audio versions. The Audiobooks all run about 2 hours in length some with 1 story and some with 2 or 3 short stories. Each one is produced with a full cast, sound effects and incidental music that fits each story perfectly. In fact, these audiobooks sound a lot like the old radio dramas from that same era. The voice actors bring to life each character perfectly. This adventure takes us to the air with a “picture-chaser” for the newsreels, yes, it is a bit dated on that aspect but the adventure is still enough to keep you on the edge. Johnny Brice is always out to get the best pictures from the mouth of danger, from flying over a shipwreck and then diving in to get the film from the tourists onboard, to flying over a forest-fire and risking life and plane to get the best film for the newsreels. Finally when Johnny is sent over to cover the war between Japan and China and is captured by the Japanese, the trio have to escape, and hopefully gather some info so Johnny and Irish can keep their jobs at world news. Lots of fun high-flying, death-defying, adventure in this one. Using the same old pulp-fiction formula of a Hero, a sidekick and a dame, Hubbard keeps you on listening until the very end. With all sorts of twists and turns in the story that you never know what will happen until the surprising end. Pulp magazines (often referred to as “the pulps”), also collectively known as pulp fiction, refers to inexpensive fiction magazines published from 1896 through the 1950s. The typical pulp magazine was seven inches wide by ten inches high, half an inch thick, and 128 pages long. Pulps were printed on cheap paper with ragged, untrimmed edges. The name pulp comes from the cheap wood pulp paper on which the magazines were printed. Magazines printed on better paper were called “glossies” or “slicks.” They were most often priced at ten cents per magazine, while competing slicks were 25 cents apiece. Pulps were the successor to the penny dreadfuls, dime novels, and short fiction magazines of the 19th century. Although many respected writers wrote for pulps, the magazines are best remembered for their lurid and exploitative stories and sensational cover art. L. Ron Hubbard published many short stories and novellas during this period in these pulps. Galaxy Press has been reprinting these stories and have created their own pulps (these have better paper quality) featuring stories from the many genres in which Hubbard wrote. I have to admit my favorites are from the Science-Fiction and Fantasy genres, but recently I’ve been exploring some of the other genres. I’ve been amazed at what other genres I began liking; such as Westerns. I never thought I’d be a fan of westerns, but Hubbard wrote some fun stories in that genre. My favorites, other than sci-fi/fantasy, seem to come from the Air and Sea Adventures, maybe that has to do with my Navy background. What also makes these stories fun is that I’ve chosen to listen to these books. 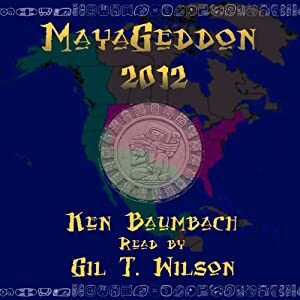 I love audio books and when I first tried out one of these stories from Galaxy Audio, I was amazed. First of all they sound like old radio dramas, like back in the day the stories were originally published, and the talent behind these productions is phenomenal. Starting with the actors, these stories take on a new life with superb voice actors performing them. The actors even give the characters a larger than life feel which is true to the Hubbard stories. The next aspect of these stories in audiobook is the sound effects and music. Between chapters and stories Galaxy Audio segues with original music that blends perfect with in the genre. The sound effects are perfect and at the same time subtle enough to not be overbearing. They sweep you up into the story and don’t allow you to let go until the end. 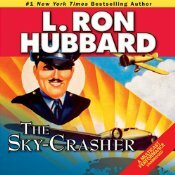 This latest excursion for me was the book “The Sky-Crasher” which featured two stories in the air-adventures genre. The first, “The Sky-Crasher,” was originally published in “Five Novels Monthly,” January 1936. Caution Jones has taken the safe side of the air travel industry since watching his father risk his life as a stunt pilot, but the days of caution are over when the world’s airlines are to compete for a million dollar contract. He knows it’s a risky venture to race around the world but when the rival airline tries to sabotage his every move, caution must be thrown into the wind and win the competition to save his airlines. “Boomerang Bomber” is the second story in the book and was originally published in “Sky Aces magazine” June, 1938. Clint Ragen has been contracted to take a bomber to China. The Japanese consider this an act of War and seize Ragen’s bomber (which is in crates, not yet assembled) and threaten to imprison Ragen. The problem is Ragen is the only person that knows how to assemble the bomber. Maybe he can work off his imprisonment by assembling the aircraft or maybe he has other plans. Two great stories, both with some great air battles, one with guns and one with wits. I don’t think I’m too far off base when I say that Galaxy Audio produces these stories by L. Ron Hubbard as if they were old time radio dramas. When I was a kid (which really wasn’t that long ago…I keep saying that enough and it’ll be true) I used to stay up late at night with a portable transistor AM radio and tune in to some radio shows that came from some radio station in the Midwest. I just loved the thrills and chills produced by audio only, and that feeling comes back every time I listen to these Galaxy Audio productions. They provide excellent vocal acting, sound effects that envelope you into the story and incidental music that makes the transition between chapters and/or stories smooth. This time around I went back into their catalog and picked up an audiobook in the “Tales from the Orient” genre of Hubbard’s stories. 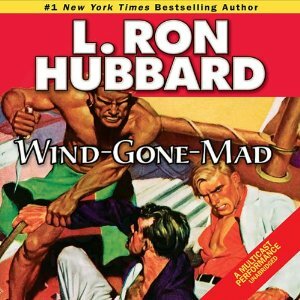 The first story “Wind Gone Mad” attracted me because I had previously listened to “The Hurricane’s Roar” which was the second story to feature the character Wind-Gone-Mad. So I was all about finding out what prompted the second story. Turned out to be a fun adventure, but the best treat was that this audio book featured the first ever published story by L. Ron Hubbard. “Wind-Gone-Mad,” originally published in “Top Notch” October, 1935 is tale of a madman’s plan to wipe out an entire province in pre-war China and how it is thwarted by the man they call “Feng-Feng”—the Chinese word for hurricane or “Wind-Gone-Mad.” Jim Dahlgren, representative of the Amalgamated Aeronautical Company, refuses to join policy to let China sort it’s own problems. Lives are at stake, especially when a villain known as “The Butcher” is allowed to rise up with fire and sword carving the way on his warpath for complete control of the nation. Dahlgren goes to find a mysterious aviator, the man called “Wind-Gone-Mad” who has always fought against the province warlords. Wind-Gone-Mad sets out to fix this broken diplomacy. 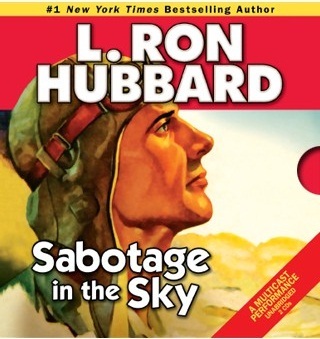 The next story is the first story by Hubbard L. Ron Hubbard published. He began publishing in February 1932 with the story “Tah,” which appeared in The University Hatchet, the newspaper of George Washington University, where he was attending college. Twelve-year-old Tah is sold to the army by his father and is forced on a 24 hour march to battle. Yellow Loot, originally published in “Thrilling Adventures” October, 1934. After getting their stash of amber stolen by a renegade army a search for the precious amber ends in a tumultuous race for freedom on the Great Wall of China. This will be the one of the most fun two hours you’ve ever spent. Enjoy! Hubbard wrote many stories for the pulps in the mid 20th century and every one was meant to captivate the reader in only a few pages. His writing achieved this but Galaxy Audio’s production of these stories into audiobooks pushes this audience captivation further. Each of these books released by Galaxy Press and Galaxy Audio are produced with excellent character acting, realistic sound effects and original music to fit the genre to transition between chapters. This time around I listened to “Sabotage in the Sky.” This story was originally published in “Five Novels Monthly” August, 1940 and tells the story of test pilot Bill Trevillian. None of the fighter planes test pilot Bill Trevillian flies are hotter than the BCA 41 pursuit ship, so he takes it up. But someone has deliberately rigged it for failure and destruction—and for Trevillian’s death. France and Great Britain are looking for the best fighters to use in the war against the Nazis and they must choose between different American plane designs to outfly the newest and deadliest Nazi fighters, the competing companies send their two best test pilots . . . Kip and Bill. Kip turns out to be an old friend of Bill’s but not one he remembers at first. Kip is a dame, and according to Bill, “Dames can’t fly.” But Kip is out to set him straight. Kip and Bill grew up together, Bill was always the best pilot, and Kip looked up to him. But when Bill ridicules her on her crash landing she sets out to get back at him. But what is worse is that the Nazis have sent a saboteur to Bill’s crew in order to keep the Europeans from gaining the air advantage. Soon Kip and Bill suspect the other of sabotage, problem that not only threatens their already electric relationship but their very lives. The contract is to be decided in a mock air battle, but soon turns deadly when the Nazis sneak a saboteur onto each plane and plan to highjack the planes for their own use. What soon turns out to be a sea and air battle the two pilots’ skills are put to the test. I’ve said it before and I’ll say it again, these audio performances of the works of L. Ron Hubbard’s pulp fiction era are magical. The stories are great adventures and fun by themselves but when Galaxy Audio does their magic in producing them into audio books they spare no talent in creating what sounds like an old time radio drama. 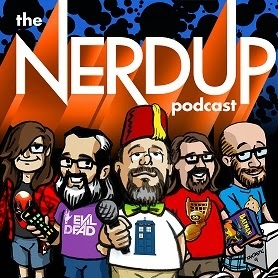 Being a radio professional, I have a strong sentiment toward audio drama and these guys really know how to create the entire atmosphere of adventure as written by L. Ron Hubbard. They use superb voice actors who not only move the story along but through some nice vocal athletics create characters that are fun and intriguing. The Special effects are superb, these guys even duplicated the sound of an experimental aircraft from the 1930s. The music definitely keeps you in the mood between chapters. 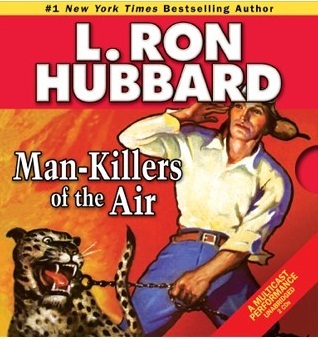 This time around it’s another air adventure called, “Man-Killers of the Air,” originally published in the June, 1935 issue of “Five Novels Monthly.” This story introduces the daredevil air racer, Smoke Burnham and his pet Cheetah, Patty. Patty usually rides co-pilot with Smoke and in combination with the name “Smoke Burnham” creates what could have easily been turned into a regular series in the funny papers. Smoke has won his chance to be entered in an international air race, he really needs to win this one because of a bet he’s made with a newspaper mogul who has been trying to sabotage him. If he wins the mogul will rebuild Smoke’s hanger, but if he loses he has to give over plans to a new aircraft which the newspaper man will then turn over to the military to help prevent the rumored attack from the Japanese. 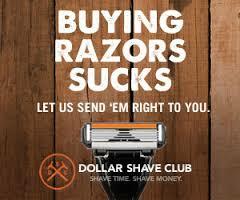 This will make the mogul look good, and sell papers. The race will carry Smoke across the Brazilian Jungle and the Andes and will be his most dangerous flight ever. Not only does he have to fight the stressful flight but someone is trying to sabotage his planes. On top of this, there’s a dame involved. Smoke is in love but the woman resents his love of flying. So on top of beating the odds and winning the race he must win over the gal. Great adventure to keep you on the edge of your seat for this one…so check it out. This story, “Sky Birds Dare!,” was originally published in Five-Novels Monthly September, 1936. and tells the story of a glider pilot, trying to demonstrate the value of gliders and gliding techniques in war. Not only does he have to convince the Navy of their value but he has to survive a competitor’s ruthless attempts to destroy him. Ace glider pilot Breeze Callaghan is an definitely an Ace when it comes to gliders, although he has never flown a powered aircraft. There are two ways Breeze believes they can be used to aid the war effort: they’ll keep a plane aloft when engines cut out, and gliders will be able to enter enemy airspace silently—a perfect way to spy undetected. Breeze loves the feel of the glider in flight, because a powered craft is always beating the air into submission, a glider uses what nature gives to move through space. Callahan’s ruthless competitor, Badger O’Dowell, has other ideas. Badger’s determined to get the Navy to buy his training ships instead. So every chance he gets He sabotages Breeze’s demonstrations. These sabotages not only wreck the gliders but endanger Breeze’s life. After several run-ins with O’Dowell, Breeze finally just decides to set a flight record, after saving himself from one sabotage by using heat updrafts to stay aloft. He decides to use a storm and the landscape to fly down the Appalachian Mountains. The storm becomes too much for him and the plane following and soon Breeze has to use his skills to save lives. This book will keep you on the edge as Breeze manages to save himself through all the flights.